This photograph has been scaled down; full resolution photograph is available here (740 by 592 pixels). Looking down Pier 1010, toward the Navy dry docks. The minelayer Oglala,lay on her side ship in front of Oglala, is cruiser Helena. 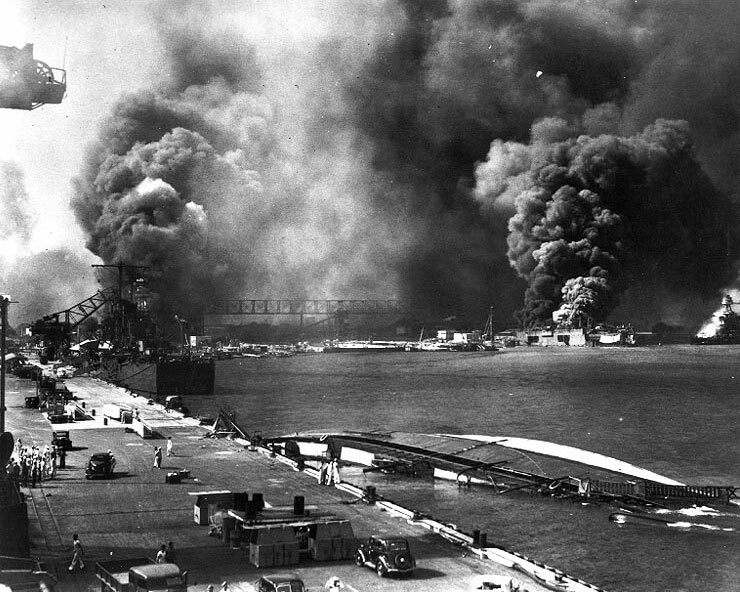 Smoke at right, comes from the destroyer Shaw. Smoke to the left, from the burning destroyers Cassin and Downes. Battleship at far right, is U.S.S. Nevada beached and on fire. One Japanese freighter beached and burning and another grounded by the stern and trailing oil on the coast of French Indochina (Vietnam) north of Qui Nhon after being attacked by 175 USN carrier planes, Jan 12, 1945.